I had to cancel all my appointments today following the very sad and shocking news of the passage of my friend of over 46 years – Taiwo Ogunjobi, this morning. I have been unable to function properly as I recall the early days and years of a fascinating relationship that only became temporarily chilled later in adult life when the political struggle in Nigerian football stretched our friendship without ever been able to destroy it. Nothing could have damaged the foundation of a friendship that we built at the point of evolving into adulthood together, getting an education, playing football, having our families and ageing in recent years. I sought out Taiwo in 1972/73 when he was in Higher School at Ibadan Grammar School. He and several other great players, Christopher Stober, Vicent Eburajolo, Victor Giwa, Chris Okolo and so on, students/footballers under the tutelage of former Governor Lam Adesina who was then the schools game master, they were stars of academicals football in that year. I went and met them, and convinced 5 of thèm from the school to join me in WNTV/WNBS football club where I was serving out my one-year compulsory Industrial attachment after OND, and was the young officer (and football player) in charge of the club, to play in that year’s Western State Challenge Cup competition. We set up a fantastic team of very young players that put up a very exciting performance but lost in the only match we played at the Olubadan Stadium, against NEPA or Police FC (I believe). As a result of that experience we became friends and started a relationship and football careers. We were age mates, separated only by months. Yet when the others, including Taiye, played for the Academicals (State and National) I was a senior player for both State and Country. He joined Shooting Stars ahead of Kunle Awesu, Muda Lawal and I, even though in the same year in 1974! We formed a formidable bond in the team. My relationship with Taiye, as I called him, was a one designed for a good story book. Only he and I, probably, know some of the details of our special relationship. Taiye gave Kunle Awesu, Muda Lawal, Sunday Akande and I (all of us playing for Housing Corporation FC) the confidence we needed to join him in Shooting Stars. I was the key facilitator of his move on a full scholarship to study in the US. I was very integral to the wife he eventually married, my ‘sister’ Bukola, an angel from heaven in his life; I facilitated his invitation to the national team, and smoothened his ascendancy to captaincy of Shooting Stars even after he left to study for 4/5 years and returned to rejoin the tram and assume leadership as captain. There is a depth to our relationship that is reserved for family. Indeed, we became a family as we joined our parents and our siblings in the relationship. Easily Taiwo was closest to me through the years of my football career until I retired and even after. Our early years in retirement qwnt in about of unforgettable escapades and adventures meant for the movies. We would recall them occasionally for long after he went into club football administration and I into the sports business. Nigerian football politics and our quest for positions in it during anothwr phase of our lives, particularly after his stint as Secretary General of the NFA, created a gulf that we never completely bridged again since then, even though we remained friends but without the same old very strong bonds. In the past two years the elements brought ua together more often and we both tried hard to rebuild the bridge. Unfortunately, a lot of water had passed under the bridge and thibgs never were the same again even though we nevwr departed from being friendly to each other. The original links between us could never be broken. A couple of weeks ago we met at Governor Rauf Aregbesola’s office in Oshogbo and were the envy of all onlookers as qe rekindled our old laughter and jokes. For the first time in a long while inhibitions were completely shattered and we recalled our happiest moments again. He was indeed one of the first people to encourage me and to wish me well on learning of my gubernatorial ambitions in Ogun State. We exchanged several SMS messages, and he actually made me speak with Buky his wife on phone from Oshogbo. To crown a return to our family status, whilst Wole, my younger brother, was in town a few weeks ago, he spent a weekend at Rotimi’ s (Taiwo’s younger brother, Wole’s friend also from secondary school till now), in Lagos. A few days after that, Rotimi and his wife actually came to my home in Lagos ànd made a hefty donation to my political campaign fund, to my utter pleasant surprise and gratitude. Taiye’s death is very big and painful blow. It will be devastating to a while army of friends in the sports fraternity that he courted and often also empowered through the years. His passage is a reminder of our mortality as well as the vanity of the pursuit of materialism and even scoring cheap political points at the expense of genuine friendship and unconditional love. We are all ageing and getting slowly and steadily to the gates of our earthly terminus, waiting for our turn to return to our Creator when the knell tolls. Taiwo was a great administrator and master of the political game. He served football, Oyo and Ogun States, and the country very well. He will love in our hearts for as long as we live. His place in the annals of Nigerian football is assured. May the Lord console his wife, his surviving siblings, his children and grandchildren. Goodnight my brother and friend, Taiwo Ogunjobi. 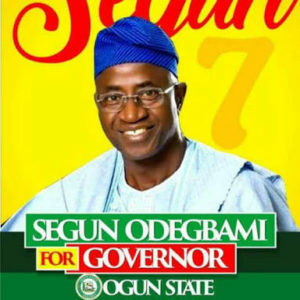 OPINIONS: THE LAZARUS PARABLE OF OGUN STATE, THE KILLER AND THE RESSURECTOR.